Recent studies into the experiences and failures of health care services, along with the rapid development of patient advocacy, consumerism and pressure groups have led historians and social scientists to engage with the issue of the medical complaint. As expressions of dissatisfaction, disquiet and failings in service provision, past complaining is a vital antidote to progressive histories of health care. This book explores what has happened historically when medicine generated complaints. 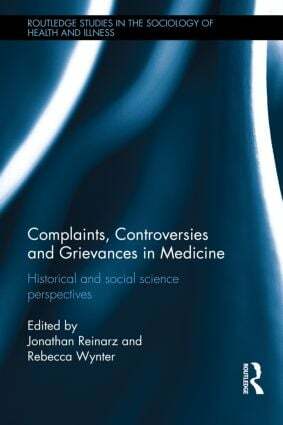 This multidisciplinary collection comprises contributions from leading international scholars and uses new research to develop a sophisticated understanding of the development of medicine and the role of complaints and complaining in this story. It addresses how each aspect of the medical complaint – between sciences, professions, practitioners and sectors; within politics, ethics and regulatory bodies; from interested parties and patients – has manifested in modern medicine, and how it has been defined, dealt with and resolved. A critical and interdisciplinary humanities and social science perspective grounded in historical case studies of medicine and bioethics, this volume provides the first major and comprehensive historical, comparative and policy-based examination of the area. It will be of interest to historians, sociologists, legal specialists and ethicists interested in medicine, as well as those involved in healthcare policy, practice and management. JONATHAN REINARZ is Professor of the History of Medicine at the University of Birmingham UK. His publications include Healthcare in Birmingham: The Birmingham Teaching Hospitals, 1779–1939(Woodbridge, 2009), and the edited collections A Medical History of Skin (with Kevin Siena; London, 2013), Medicine and the Workhouse (with Leonard Schwarz; Rochester, NY, 2013) and Permeable Walls: Institutional Visiting in Historical Perspective (with Graham Mooney; Amsterdam, 2009). He has also published on the history of the senses, including a special issue of the Journal for Eighteenth-Century Studies on ‘The Enlightenment and the Senses’ (edited with L. Schwarz, 2012) and Past Scents: Historical Perspectives on Smell (Champaign, IL, 2014), and edited a special issue of the journal Food and History (forthcoming 2014) on the history of hospital food, which inevitably touches on the subject of complaining.